Long before the fine sand and exquisite light of St. Ives were discovered by artists and tourists, the small town on the north coast of Cornwall was a thriving fishing center. At its peak, 300 fishing boats were moored cheek by jowl inside its picturesque harbor and millions of fish were landed, salted, and then exported all over Europe. Each of these boats had a tender and, as the tide went out, each tender had to settle on the sand until it was refloated by the incoming tide, twice a day, every day. Most days, the boats were given a good beating by the notorious ground sea that runs into the harbor, and on bad days they often got swamped and filled with sand. It’s a particular kind of punishment that requires a certain type of boat, as retired physician Scott Bowring discovered. The mainsail, rolled around its yard, fits neatly to one side and below the level of the gunwales, leaving the center free for a rower and a passenger or two. Scott is a member of the St. Ives Jumbo Association which keeps two 20’ Jumbos, replicas of Victorian fishing luggers, built by Jonny Nance, in the harbor. 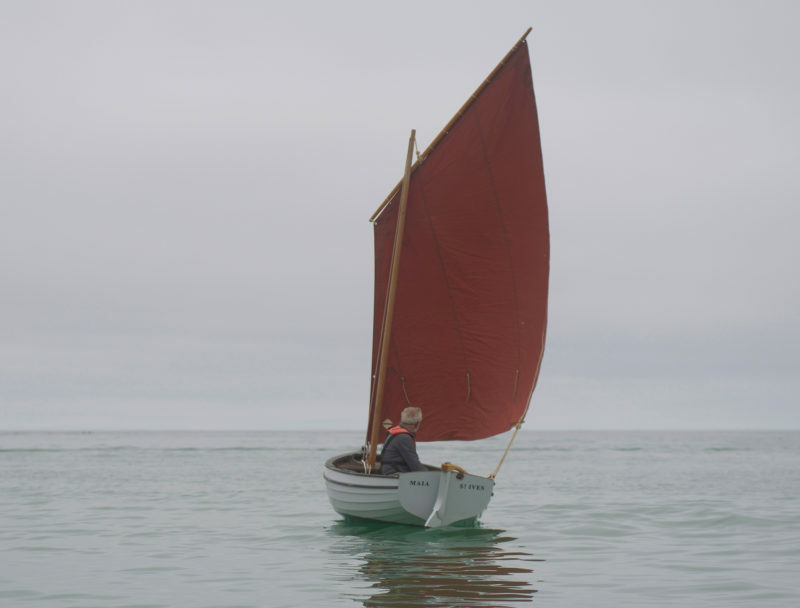 The starting point for that project was a 13′ rowing punt based on a set of lines Jonny’s father took from a traditional fisherman’s tender in 1975. 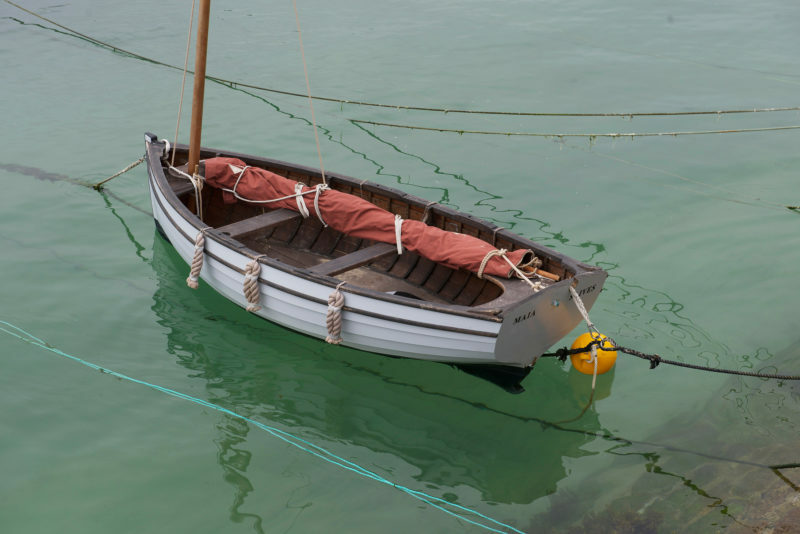 Unlike the streamlined punts from more sheltered ports such as Falmouth on the south coast of Cornwall, the St. Ives punt was short and stout, heavily built to survive the challenging conditions of St Ives harbor. But could it be made to sail? 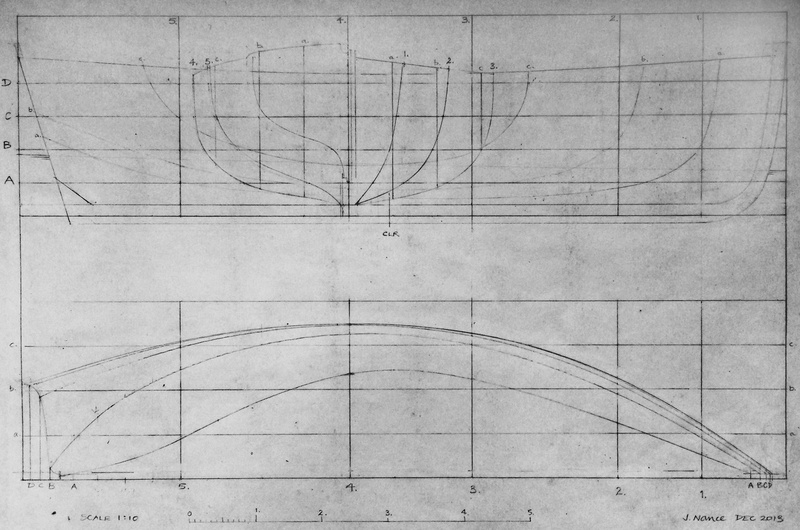 To find out, Scott teamed up with fellow Jumbo sailor Pete Lee and asked Jonny to design a sailing version of his father’s punt. The boat they specified had to be smaller and lighter than the rowing punt with a standing lug rig which would stand a trashing. It needed to be stable, so you could stand on the gunwale without tipping over, and withstand the abuse of various feral grandchildren. They didn’t want a centerboard, as the boat would be sitting on the beach at St. Ives—plus they wanted fewer moving parts for kids to get their fingers jammed. And the boat had to be pretty. Jonny built the first St. Ives sailing punt for Pete in 2014, followed by a second boat (with a slightly taller mast) for Scott in 2015. Good-quality larch wasn’t available for the planking, so Jonny built both boats of Douglas-fir on oak ribs, fastened with copper rivets. The inside was fitted with oak thwarts and grown oak knees, all sealed with a mix of Stockholm tar, linseed oil, and turpentine, which quickly turns black with age. Scott named his punt MAIA, in part after Saint Ia of Cornwall who, according to legend, sailed to St. Ives from Ireland on a leaf, and in part after one of the Pleiades, Maia, from Greek mythology. The St. Ives here has two rowing stations rigged with removable tholepins. The oars, as is customary for double tholes, are without collars, requiring a bit more skill from the rower than oars with collars used in oarlocks. 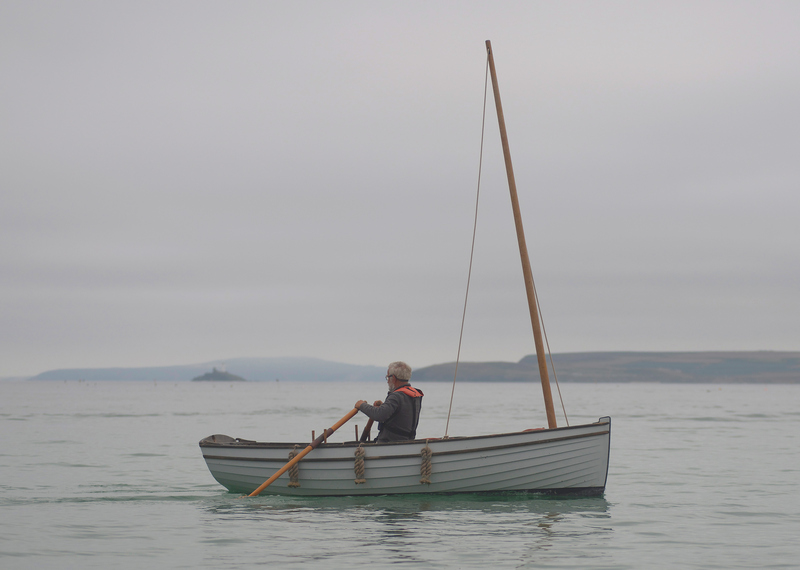 It was glassy calm and cloudy when I arrived in St. Ives to sail MAIA, so we made the most of the weather by first testing the boat in rowing mode. The St. Ives punt has two rowing stations, both fitted with tholepins rather than rowlocks. I’m not a usually great fan of this arrangement, which I suspect is usually used for aesthetic rather than practical reasons, but I have to admit I hardly noticed the difference on this occasion. With her beamy, burdensome hull, the punt is not best suited to long-distance rowing, though it carries its way well enough and you would happily row home if you had to. In practice, though, I suspect the oars are mostly used to get her in and out of harbor. The Jumbo crews are keen scullers, and the transom has been fitted with a sculling notch, set off-center so it can be used with the rudder and tiller in place. The rudder isn’t in place at the moment, but if it were, it wouldn’t interfere with sculling because the notch in the transom is set to port. The notch is circular with an opening at the top wide enough to accept the throat of the oar, but too narrow to let the leathers slip through. The arrangement keeps the oar from slipping free, handy when sculling or when using the oar as a stand-in for the rudder, as seen here. While we were trying out the oars, Scott’s other boat, ZEPHYR, turned up, and I jumped aboard to take some photos of Scott rowing and sailing his punt. The simple standing-lug rig, with its stayless mast, is extremely easy to raise and lower—one reason it was so popular with fishermen—and within a couple of minutes the boat was under way. 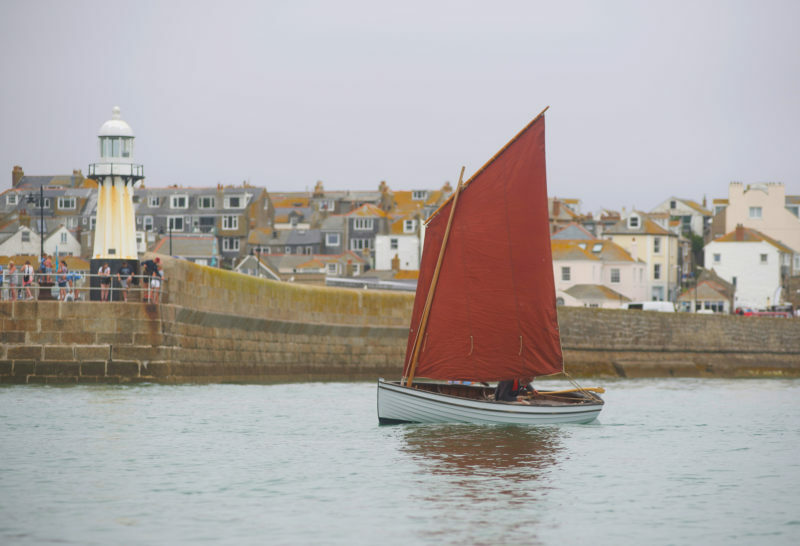 I feared the St. Ives punt might be a bit sluggish under sail, but it soon proved me wrong. Even before the surface of the water had been ruffled by the breeze, it managed to catch a breath of wind and, as if by magic, sailed away purposefully over a glassy sea, before the natural order was restored and a few ripples appeared below the bow. Even then, as a feeble wind blew hesitantly across the bay, it seemed to keep its way and made steady headway almost regardless of the wind. The loose-footed lugsail makes setting sail as simple as it can be. The mainsheet runs through a rope-stropped block with an eye that slips over thumb cleats, one on either quarter, close to the transom. A second block at the clew gives the skipper a 2:1 advantage. The punt kept up its uncanny ways after I climbed on board to join Pete, and we headed out past Bamaluz Point toward the open sea. A strong current was setting us to the west, with just a puff of wind from the southwest, yet as we turned around and headed back to St. Ives, the punt slipped along as if pulled forward by an invisible line. Of course, by then we were on a broad reach, and I suspect it would have been a very different matter if we’d had to tack to windward, not the St. Ives punt’s strong point. One unusual feature in an otherwise quite standard lug rig is the sheeting arrangement, which runs through a single block with a line which is looped over a thumb cleat on the leeward rail. When the boat comes about, the block is simply unhitched and hooked onto the opposite cleat. I wondered if a rope horse wouldn’t make life easier, but Scott told me he had tried that and the current arrangement worked better. It certainly seemed the optimum position for the sheet to be in, judging by how well the sail set, though I had my doubts about how handy it would be in really windy weather. The calm conditions combined with a strong current made it hard to judge the boat’s true sailing performance during our short outing. 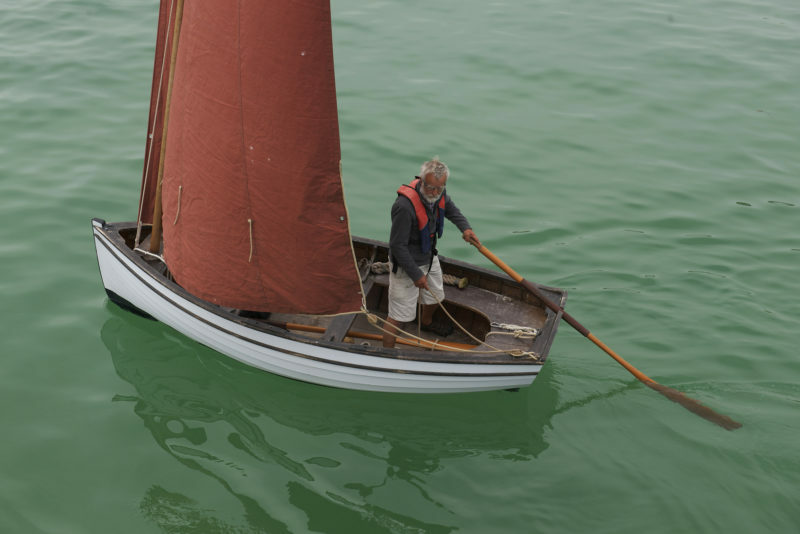 But certainly the absence of a deep keel or centerboard will affect the punt’s windward performance, though her builder insists that, providing you sail the boat full and by (not sheeting her in too tight) it performs very well. Indeed, he suggests the sailing St. Ives punts make very good training boats for the bigger Jumbos, teaching sailors how to manage a heavy boat with only a shallow keel to resist leeway. Lacking a centerboard, the punt doesn’t take well to being sheeted in too hard when working to windward. The proof of a boat is in her sailing, and MAIA certainly showed the St. Ives punt is no slouch by winning the small boat class at the Looe Luggers Regatta, in open water and against several other bigger boats, just a couple of weeks after she was launched in 2015. The following year, she won the Prettiest Boat award in her class at the Falmouth Classics regatta, proving that even a hardy St. Ives lass can win the hearts of those South Coast yachties. So confident is Scott in the St. Ives punt’s seagoing abilities that he and his wife are planning to take MAIA gunkholing around the U.K., starting with an Old Gaffers Association rally on the Isle of Wight and then heading up to Scotland to explore the lochs. And it’s this use as an expedition boat that might give the boat a greater purpose. Not everyone wants to keep a boat on a mooring in a tidal harbor that dries at low tide, but more and more people are discovering the pleasures of dinghy cruising and coastal sailing in small boats. Although the St. Ives sailing punt is small, it’s certainly sturdy and would cope with some dirty weather. For now, MAIA is doing a very good job moored off the jetty at St. Ives, going up and down with every tide, weathering the relentless ground sea just as her forebears did, and without breaking a single rib so far. Watching her sailing in her native waters, surprisingly nimble despite her sturdy construction, I can’t help feeling that a bigger future awaits her beyond St. Ives, beyond the Isle of Wight, and beyond Scotland even. This traditional, local design, reborn for modern times, deserves to travel the world. Nic Compton is a freelance writer and photographer based in Devon, England. He has written about boats and the sea for 24 years and has published 14 nautical books, including a biography of the designer Iain Oughtred. He currently sails a 14’ Nigel Irens skiff and a 26’ Chuck Paine sloop. St. Ives punts are built by and available from Jonny Nance. Inquire about pricing. Great looking boat, purpose built and versatile. Where does the tack downhaul connect? PS I love the story of how the St. Ives Jumbo Association wanted to build the Luggers but started with the punt first. Smart! Thanks for your comments, Kent. To avoid using unnecessary fittings, a line from the tack passes down the for’ard side of the thwart, around the mast beneath and back up to the tack where it’s made off. The Jumbo Association story is comprehensively covered by Nic Compton in last Sept/Oct issue of WoodenBoat: “The St. Ives Jumbo: A small boat with a big name'” though I appreciate your interpretation! Lovely looking craft, well thought out and built, very similar lines to a 10 ft dinghy I owned about 55 or so years ago. Very rugged and stable little craft and great fun to sail. I had some great times in that one. Thanks, Douglas. Sounds as if you would know. How was yours rigged? Looks like a smaller Ilur, without the centerboard. You’re right—at least above the waterline, or possibly more like the Aber? Hardly surprising as all three are derived from similar traditional craft and designed for a similar purpose. The characteristic raking mast is the only way to achieve an efficient standing lug with a near vertical luff. The lack of a centerboard obviously does effect windward performance but not to the extent one might expect and in windy conditions, with the extra weight of a second crew member, she sails to windward very well. Beating back to Cowes from Osborne Bay on a windy afternoon during the Old Gaffers Association regatta this summer, all the small boats, with the exception of MAIA, kept inshore out of the worst of the blow. MAIA stayed out, always felt safe, and outsailed all the boats of comparable size and several somewhat larger. My punt was the first of Jonny’s sailing punts to be built. When we launched her in 2014, I was amazed by how well she performed. Sailing, rowing and sculling are all a delight. Jonny made me some 7’6″ oars for her and, with such an easily driven hull, she can be rowed comfortably for quite a distance without strain. My sail is slightly smaller than MAIA’s above, but she sails just as fast.